Completion St. Mary’s JSO Church reconstruction and consecration celebrated by His Eminence Mor Titus Yeldho and His Eminence Mor Clemis Eugene Kaplan. V. Rev. Fr. Thomas' service to the Holy Church began at the age of eight when he was appointed as an altar boy at St. Thomas Jacobite Church, Thiruvanchoor by His Eminence Mor Clemis Abraham. He was ordained as sub-deacon (qoruyo) at seventeen and full deacon after completing his seminary studies both by His Grace Mor Gregorius Gheevarghese (Perumpilly Thirumeni). In 1986, before his ordination to priesthood, V. Rev. Fr. Thomas married Ms. Achamma Alackaparambil (Kochumol). Later that year, at the age of twenty-two, V. Rev. Fr. Thomas was ordained to priesthood by His Grace Mor Gregorius Gheevarghese. While tending to these congregations, he served in other capacities as the Vice President of the Malankara Jacobite Youth Association and Editor of the Syrian Sandesam. In 1993, His Eminence Mor Athanasius Yeshu Samuel appointed V. Rev. Fr. Thomas as the new vicar of St. Mary’s Church, Los Angeles and made necessary arrangements for his emigration in the same year. His wife, son, Eldho, and daughter, Alby, followed two years later. In 2012, V. Rev. Fr. Thomas was elevated to the rank of Corepiscopo on October 13. The evelation was officiated by His Eminence Mor Titus Yeldho Pathickal and His Eminence Mor Clemis Eugene Kaplan. V. Rev. Fr. 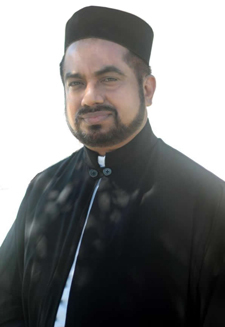 Thomas’ deep commitment to the Church and our faith continues in the United States, where he has served as Chairman of Kerala Christian Fellowship of Southern California and is a member of the Oriental Orthodox Churches Council. The son of late Mr. K.K. Thomas and late Mariamma, V. Rev. Fr. Thomas was born and raised in Thiruvanchoor, Kottayam District, Kerala. He holds a Bachelors degree in Sociology from Kerala University and a Masters degree in Malayalam Literature from the University of Trivandrum. V. Rev. Fr. Thomas currently resides in Winnetka, California with his wife and two children.